It's time to break out the dictionary again. 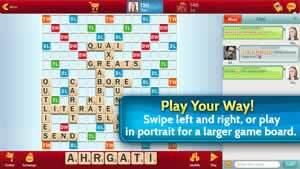 Scrabble is now available for free for Android and iOS devices everywhere. Pit your knowledge of vocabulary against the computer or another human mind, and see who will walk away with the most points on the board. Just realize one thing before you get started; this is not a controlled game. 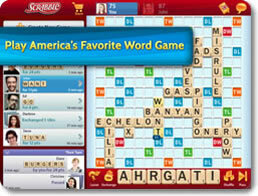 This version of Scrabble aims to simulate the experience of sitting around the table with your friends. That entails a number of things. Do you want to play on your honor? You can. Want to see if you can get away with a little cheating? Go right ahead. Anything is possible with this edition of Scrabble, so get some words on the mind and spell them out on the board right away! Scrabble as you know it remains unchanged. The object is as simple but deep as it's always been. Just spells words from the letters on the board and those in your collection. Additionally, it includes a host of other features guaranteed to improve your Scrabble experience. Earn more points by using rare letters like J, Q and X. Spell a word on a Double or Triple Word square to increase the points it will yield greatly. Supports six different languages, including English, Spanish, French, Italian, German and Portuguese. Activate the Teacher feature to get a look at what the best word for every turn could have been. Check your theoretical words before laying them down on the board with the included Dictionary. Scrabble supports solo play against the computer like any game should. However, if that's not challenging enough for you, then get ready to face other players in a multitude of ways. Challenge your friends on Facebook with a single click of a button. Play up to 50 separate games simultaneously. Use the built-in chat feature to communicate with other players while a game is in progress. Post your best scores online to show the world your superior vocabulary. Want to play a little dirty? Try sneaking a few tiles onto the board when it's not your turn. Hopefully, your opponent won't be watching. Scrabble is a simple game that has been entertaining players and expanding people's language skills for nearly eight decades now. This mobile version takes everything that made the board game great, shrinks it down into a convenient digital package, and allows anyone to start a game up at any point in time. 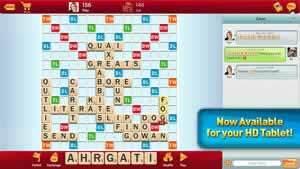 If you're an avid Scrabble player or are just looking for a little app to get you through a long commute, then this is the perfect addition to your mobile game library.